This popular pointing and bird hunting breed hails from Brittany, the Celtic area of northwest France which lies just across the English Channel from Wales. 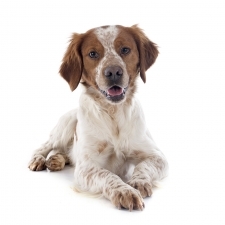 It is believed that the Brittany was developed by crossing the Orange and White Setter with an unidentified French dog. They also look similar to the Welsh Springer Spaniel, so it is quite likely they may be related. The first records of the Brittany are from paintings and tapestries dating back to the 17th century. They became very popular with hunters as they were mild, submissive, and wanted to please. The Brittany was introduced to the United States in 1931 and, once they became known, became very popular. These are happy, eager-to-please dogs, making them excellent hunting dogs. They are intelligent, loving, and gentle. The Brittany is a good-natured, and easy to care for breed who enjoys being with their family. These dogs need daily exercise and mental stimulation every day. As these dogs are sweet and even-tempered, they do well with children, but as with all dogs, parents need to be vigilant to make sure both the children and the dog learn how to interact with each other. This dog makes a wonderful family addition because of its jolly nature. The Brittany usually weighs between 35 to 40 pounds and stands approximately 19 to 20 inches tall. They have a flat, fine coat that is of medium length and slightly wavy. They come in orange & white and liver & white. The Brittany is an immensely popular hunting dog and has a keen nose. They retrieve from both land and water. They adapt to all kinds of terrain, woods, plains or hills. They are resistant to cold and damp conditions. They are mainly used for hunting small birds such as quail and partridge.